BERKELEY, CA � Researchers in the Materials Sciences Division (MSD) of Lawrence Berkeley National Laboratory, working with crystal-growing teams at Cornell University and Japan's Ritsumeikan University, have learned that the band gap of the semiconductor indium nitride is not 2 electron volts (2 eV) as previously thought, but instead is a much lower 0.7 eV. 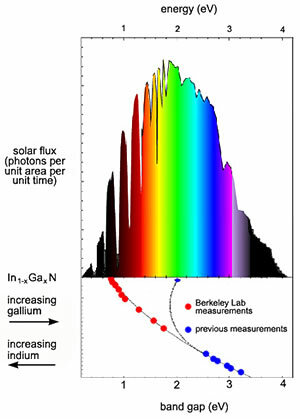 The serendipitous discovery means that a single system of alloys incorporating indium, gallium, and nitrogen can convert virtually the full spectrum of sunlight -- from the near infrared to the far ultraviolet -- to electrical current. "It's as if nature designed this material on purpose to match the solar spectrum," says MSD's Wladek Walukiewicz, who led the collaborators in making the discovery. Many factors limit the efficiency of photovoltaic cells. Silicon is cheap, for example, but in converting light to electricity it wastes most of the energy as heat. The most efficient semiconductors in solar cells are alloys made from elements from group III of the periodic table, like aluminum, gallium, and indium, with elements from group V, like nitrogen and arsenic. One of the most fundamental limitations on solar cell efficiency is the band gap of the semiconductor from which the cell is made. In a photovoltaic cell, negatively doped (n-type) material, with extra electrons in its otherwise empty conduction band, makes a junction with positively doped (p-type) material, with extra holes in the band otherwise filled with valence electrons. Incoming photons of the right energy -- that is, the right color of light -- knock electrons loose and leave holes; both migrate in the junction's electric field to form a current. Photons with less energy than the band gap slip right through. For example, red light photons are not absorbed by high-band-gap semiconductors. While photons with energy higher than the band gap are absorbed -- for example, blue light photons in a low-band gap semiconductor -- their excess energy is wasted as heat. Dozens of different layers could be stacked to catch photons at all energies, reaching efficiencies better than 70 percent, but too many problems intervene. When crystal lattices differ too much, for example, strain damages the crystals. The most efficient multijunction solar cell yet made -- 30 percent, out of a possible 50 percent efficiency -- has just two layers. The first clue to an easier and better route came when Walukiewicz and his colleagues were studying the opposite problem -- not how semiconductors absorb light to create electrical power, but how they use electricity to emit light. "We were studying the properties of indium nitride as a component of LEDs," says Walukiewicz. 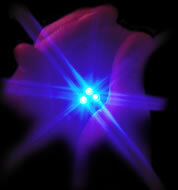 In light-emitting diodes and lasers, photons are emitted when holes recombine with electrons. Red-light LEDs have been familiar for decades, but it was only in the 1990s that a new generation of wide-band gap LEDs emerged, capable of radiating light at the blue end of the spectrum. Light emitting diodes made of indium gallium nitride held clues to the potential new solar cell material. "But even though indium nitride's band gap was reported to be 2 eV, nobody could get light out of it at 2 eV," Walukiewicz says. "All our efforts failed." When the Berkeley Lab researchers studied these exquisitely pure crystals, there was still no light emission at 2 eV. "But when we looked at a lower band gap, all of a sudden there was lots of light," Walukiewicz says. The collaborators soon established that the alloy's band-gap width increases smoothly and continuously as the proportions shift from indium toward gallium, until -- having covered every part of the solar spectrum -- it reaches the well-established value of 3.4 eV for simple gallium nitride. To exploit the alloy's near-perfect correspondence to the spectrum of sunlight will require a multijunction cell with layers of different composition. Walukiewicz explains that "lattice matching is normally a killer" in multijunction cells, "but not here. These materials can accommodate very large lattice mismatches without any significant effect on their optoelectronic properties." Indium gallium nitride's advantages are many. It has tremendous heat capacity and, like other group III nitrides, is extremely resist to radiation. These properties are ideal for the solar arrays that power communications satellites and other spacecraft. But what about cost? "If it works, the cost should be on the same order of magnitude as traffic lights," Walukiewicz says. "Maybe less." Solar cells so efficient and so relatively cheap could revolutionize the use of solar power not just in space but on Earth. "Effects of the narrow band gap on the properties on InN," by J. Wu, W. Walukiewicz, W. Shan, K. M. Yu, J. W. Ager III, E. E. Haller, Hai Lu, and William J. Schaff, appears in the journal Physical Review B, 15 November 2002. Investigations of indium gallium nitride have also been reported in "Unusual properties of the fundamental band gap of InN," by Wu, Walukiewicz, Yu, Ager, Haller, Lu, Schaff, Yoshiki Saito, and Yasushi Nanishi, Applied Physics Letters, 27 May 2002, and in "Small band gap bowing in In1-xGaxN alloys," by Wu, Walukiewicz, Yu, Ager, Haller, Lu, and Schaff, Applied Physics Letters, 24 June 2002.